We’d love your help. 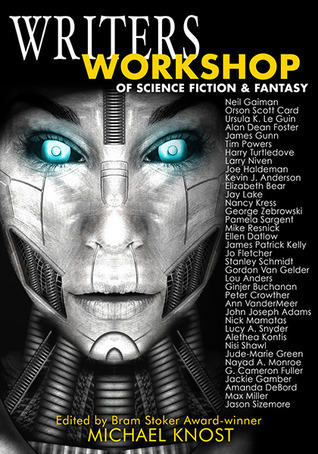 Let us know what’s wrong with this preview of Writers Workshop of Science Fiction & Fantasy by Michael Knost. This is, after all, a colle Writers Workshop of Science Fiction and Fantasy is a collection of essays and interviews by and with many of the movers-and-shakers in the industry. Each contributor covers the specific element of craft he or she excels in. Expect to find varying perspectives and viewpoints, which is why you many find differing opinions on any particular subject. To ask other readers questions about Writers Workshop of Science Fiction & Fantasy, please sign up. I loved this book! It was fascinating to get a peek into the minds of some of the big names in the genre. I wasn't familiar with many of the authors because I haven't done extensive reading in the sci-fi/fantasy genre but every one of the essays was impressive and easy to become engaged in. Michael Knost obviously knows what he is doing. Don't let the title fool you, this book is for writers and readers of any genre. I am not a writer so I can't tell you how useful this book would be for one, bu I loved this book! It was fascinating to get a peek into the minds of some of the big names in the genre. I wasn't familiar with many of the authors because I haven't done extensive reading in the sci-fi/fantasy genre but every one of the essays was impressive and easy to become engaged in. Michael Knost obviously knows what he is doing. Don't let the title fool you, this book is for writers and readers of any genre. I am not a writer so I can't tell you how useful this book would be for one, but as a reviewer and avid reader I found all the essays informative. It will also give you a new appreciation for what it takes to be a writer. I have never really toyed with the idea of writing a story and after reading this there is no way in hell I would try! . One of the big lessons you will take away from this is writing is work and you have to write and read (outside your genre too) every day. I really liked how Editor Michael Knost put the book together. Each author took a different aspect/technique of writing. Starting with Neil Gaiman's essay on where ideas come from, to Orson Scott Card's on rhetoric and style, to Elizabeth Bear's tactics on world building. The last two chapters are a Q&A with editors about what they look for in short stories and novels. If you are a novice at the whole publishing thing then you might be surprised by the process for picking stories. Seventh Star Press has two amazing artists that do commissioned work for their titles. You can go to the SSP website to see some of it. The paperback version of The Writers Workshop that I have contains three beautiful black and white illustrations, but unfortunately some quality is lost in the printing. If you purchase the special editions from the SSP website I think the pictures are a better quality. I can't forget to mention the amazing cover art by Mathew Perry. He captured the essence of the book perfectly. If you are a lover of speculative fiction or just curious about the process of writing then definitely pick this book up. This is a pretty eclectic anthology. Some of the famous authors get weird topics, such as Neil Gaiman on how he gets his ideas (always a bad subject, as he pretty much says in this essay). Some of the essays are very specific to SF, while others deal with writing in general (Joe Haldeman on Hemingway's writing tips). I'm new to SFF and am trying to write a fantasy novel. This book gave me plenty ideas about style, readers, and the business. And it gave me a better grasp of the genre. On the whole This is a pretty eclectic anthology. Some of the famous authors get weird topics, such as Neil Gaiman on how he gets his ideas (always a bad subject, as he pretty much says in this essay). Some of the essays are very specific to SF, while others deal with writing in general (Joe Haldeman on Hemingway's writing tips). What if you could ask Neil Gaiman where he gets his ideas from? What if Orson Scott Card gave you his insights on developing voice and style? Imagine picking Elizabeth Bear's brain on the joys and intricacies of world building? "The only thing an author can always depend upon is craft. Craft doesn't always enable the author to scale mountains. That depends on the author's talent and inspiration and dedication. But craft is like th I received a free copy of this book in return for an honest review. "The only thing an author can always depend upon is craft. Craft doesn't always enable the author to scale mountains. That depends on the author's talent and inspiration and dedication. But craft is like the mountaineer's tools and experience. They help when the going gets tough." The Writers Workshop of Science Fiction and Fantasy is full of entertaining and informative short essays by some of the most respected writers in the genres. The difficulty with books of this kind is that it can be a retread of other writing guides that do it in more detail, but this one, while it does present some material you've probably read before, skirts the problem by being something much more. Sometimes it's good for writers to understand the genres they are writing for, and how it got there. Sometimes reinventing the wheel isn't necessary, and sometimes, maybe it is. Starting with the inception of the idea with Neil Gaiman's essay 'Where Do You Get Your Ideas?' through to the tough middle and the endings, authors have their own ways of dealing with each area, but reading how successful authors do it is instructive and their voices of experience shines through each workshop. These writers love their craft and it shows whether they are writing their next novel or sharing their most important lessons about being a writer that people will want to read. Middles that justify the openings and earn the endings are the hardest to develop. Particularly good are the ones on 'Middles' by George Zebrowski, 'On Rhetoric and Style' by Orson Scott Card and a thought-provoking one on 'Unbending Gender' by Nisi Shawl that includes a link to a fun and gorgeously detailed chart on the pathways to stereotyped female characters. This book is the collected wisdom of those who not only have been there, but have done it amazingly well. Each essay is chock full of experience, examples and anecdotes that reminds us why we love these writers. It's not only a writers' guide, it's a fans' guide into the minds of our favourite authors. Entertaining, illuminating and challenging, this book is for readers and writers alike. I give it a 4.5 out of 5 stars. A good, instinctive style that is a pleasure to read cannot be taught or learned directly. Is there nothing you can do, then to enhance your own style, to improve it? Why, of course there is! But, paradoxically, you don't do it by working on your style. I bought the print edition of this book and decided as I was reading it, I would jot down a few notes on subjects the book addressed. I figured I would get a lot of anecdotes and maybe a little industry inside info, so I wasn't expecting much. By the time I'd finished the book, I had over 22 pages of notes on the actual CRAFT of writing. Hands down this was one of the best books I've bought for learning how to actually "write." "Workshop" books like these tend to feature authors talking about wha I bought the print edition of this book and decided as I was reading it, I would jot down a few notes on subjects the book addressed. I figured I would get a lot of anecdotes and maybe a little industry inside info, so I wasn't expecting much. By the time I'd finished the book, I had over 22 pages of notes on the actual CRAFT of writing. Hands down this was one of the best books I've bought for learning how to actually "write." "Workshop" books like these tend to feature authors talking about what it's like to write. Very few authors seem to actually know how to teach novice writers the skills they need to be effective writers. This book is unique in that it is made up of authors who CAN and WILL teach you how to develop those skills. The elements of fiction writing (structure, plot, characterization, dialogue, etc.) are covered topics, and I have to say the sections on beginnings, middles, and ends were some of the most helpful to me and would apply to ANY genre. A lot of the information contained in these sections I had not heard before, and this was where I took the bulk of my notes. There are sections specifically devoted to speculative fiction, dealing with writing aliens, world building, gender bending, etc. but 90% of the book is simply good solid fiction-writing advice. A few essays deal with the business end of things, and a couple of them address specific markets. The only essay which I found disappointing was, oddly enough, Neil Gaiman's opening piece on "where do you get your ideas." Rather than being a teaching tool to help writers develop interesting premises, it's more "I'm Neil; see how clever and funny I am." But don't let that stop you from getting into the meat of the book. Think of this as a very engaging textbook to get the most out of it. Read the essays for fun, then go back and re-read them as teaching tools. I've read a couple of "how-to" write books before-in fact I'm reading one right now-but most of them I did not burn through as quickly as I did this anthology. Rather than give tired and trope advice and "writing exercises", this book simply asks authors and editors how they do what they do. Sure, it's technically a "how-to" book, but I read this as more a collection of Essays on writing by authors. And authors we have heard of too. Often the names included in these types of books are names that I've read a couple of "how-to" write books before-in fact I'm reading one right now-but most of them I did not burn through as quickly as I did this anthology. Sure, it's technically a "how-to" book, but I read this as more a collection of Essays on writing by authors. And authors we have heard of too. Often the names included in these types of books are names that only people well versed in a particular genre would have ever known; they aren't household names, even within the speculative fiction genre. These essay were quite effective at getting some solid advice across to the reader, and that was great, but what pulled me in was the fact that most of these Essays in some way *inspired* me to apply that train of thought or idea to my own writing. I enjoyed that as I typically shrug my shoulders and put the idea on a back burner in other books of this nature. This was very readable and I was surprised and upset when I reached the end of the book. I don't usually get jarred out of reading that particular way unless I am reading an engaging novel that has pulled me in to the exclusion of all else. The last two chapters are particularly insightful in that they are round table discussions of editors of both short form and long form fiction; magazine and anthology in the former and publishing house editors in the latter. I highly recommend this book to those looking to write speculative fiction, or as a reader, to better understand the authors of speculative fiction and how they create such amazing worlds for their readers. I was placing this book on my shelf and saw that it was the 13th book I've read on the subject of 'how to write' sort of stuff. At this point, I'm getting the feeling that I've about covered all the most obvious stuff, some are about story, others about inspiration, some about dialog, grammar, editing, you get the idea. This book was a collection of essays on all of that stuff from sci-fi and fantasy authors. It's a a collection of essays that are, I believe, all available elsewhere if someone i I was placing this book on my shelf and saw that it was the 13th book I've read on the subject of 'how to write' sort of stuff. At this point, I'm getting the feeling that I've about covered all the most obvious stuff, some are about story, others about inspiration, some about dialog, grammar, editing, you get the idea. This book was a collection of essays on all of that stuff from sci-fi and fantasy authors. It's a a collection of essays that are, I believe, all available elsewhere if someone is so inclined as to track them all down. Having them all assembled here though, it made it easy for me to not do that. And so, I read about beginnings, middles, ends, how to write from differing viewpoints, all interesting stuff. I think that like any book of this type, that you tend to get out of it what you put into it. You know, if you actually sit and think about what you're being told and put some of those ideas into practice, then it's helpful. So, for me, it was a great read, I did enjoy the insight into the mess of a man that Hemingway apparently was, I enjoyed the discussion of gender in spec fic, of things like how to ask the second that third questions.... all very good stuff. This type of book is extremely hard to review. First we have a number of authors contributing to the book. Then add to that the type of book and it makes it very hard to give a review. But I will do my best. This book has several interviews from the authors listed above. It gives some relatively clear cut thoughts on where they get their ideas from, or what the best way to build a world is. It is basically an advice book for want to be authors. As an up and coming (hopefully soon) author I was re This type of book is extremely hard to review. First we have a number of authors contributing to the book. Then add to that the type of book and it makes it very hard to give a review. But I will do my best. It is basically an advice book for want to be authors. As an up and coming (hopefully soon) author I was really looking forward to reading this book. Especially since the title said Fantasy and one of my novels is a fantasy. But what I found is just opinions. While this is helpful in some ways, it wasn't what I was expecting. The tips the authors gave were general knowledge that I learned in my Creative Writing courses in College. I will say this book was interesting and actually entertaining. I will recommend this book to anyone who would like to know more about these authors or for that matter more about science fiction and fantasy genre writing. Okay, when I got this book to review, I had anticipated a lot of info that I could work with and practice. I have to say that I was very disappointed. Just from the title, Writers Workshop of Science Fiction and Fantasy, I had expected to find lessons and worksheets to use. I had hoped to see tables and charts and all sorts of info I could apply. I found that this was not what the title had led me to believe. It was a collection of essays from various science fiction and fantasy writers talking a Okay, when I got this book to review, I had anticipated a lot of info that I could work with and practice. I have to say that I was very disappointed. Just from the title, Writers Workshop of Science Fiction and Fantasy, I had expected to find lessons and worksheets to use. I had hoped to see tables and charts and all sorts of info I could apply. I found that this was not what the title had led me to believe. It was a collection of essays from various science fiction and fantasy writers talking about their experience. That was all it was. Now, I'm not saying that isn't good info in this book. There is, but it is delivered in a style I was not expecting. I guess it all came down to the title and what I was looking for. Workshop usually means you'll be working on material that you are learning and expanding your own experience. If I was there in person, that would be what I would expect. Instead, from this I'd just be attending a lecture: informative, but not what I was expecting. I had trouble reading this book. Maybe if I had walked into it expecting what I got, I might have felt better. Many people seem to have liked the book and given it high marks, but for me it was a huge let down. Featuring several articles and interviews from various authors, I was interested in reading Writers Workshop of Science Fiction and Fantasy because I thought it would be neat to see what the authors had to say about their writing habits and techniques. I don’t typically read a lot in the science fiction genre but I do enjoy the occasional fantasy book but I figured that the advice these authors were trying to give would apply to other genres as well, and indeed they did. Where do authors get thei Featuring several articles and interviews from various authors, I was interested in reading Writers Workshop of Science Fiction and Fantasy because I thought it would be neat to see what the authors had to say about their writing habits and techniques. I don’t typically read a lot in the science fiction genre but I do enjoy the occasional fantasy book but I figured that the advice these authors were trying to give would apply to other genres as well, and indeed they did. Where do authors get their ideas from? What exactly is science fiction, fantasy, and the sub-genres within? What is style? What are the tactics of world building? What exactly is ‘weird fiction’? What are the most common reasons manuscripts are rejected? These are just a few of the questions that are answered within this collection. If you are an author, even if it is in a genre other than science fiction or fantasy, I suggest you pick up a copy of this collection. I know that personally I learned several tips and techniques that I will try applying to my own writing. Writers Workshop of Science Fiction & Fantasy is a compilation of different articles and interviews written by various well known authors. It definitely isn't a conventional read for non writers, but still it's very interesting to discover where authors get their ideas from, the importance of beginning, middle and end, all the different genres of fantasy... Even if you're not a science fiction or fantasy reader, it's always fun to get inside the head of an author. I do think if you're a writer it really has a better purpose as it is filled with tips and techniques that will certainly be able to help your writing. Most are definitely applicable to all genres, so even if you will never in your life write a fantasy story, there is still plenty to learn. I normally read books on writing when with multiple contributors as I would an anthology. In general, there are chapters / lessons which are great and others which are either not applicable to my writing or otherwise of less value. Not the case with "Writers Workshop of Science Fiction & Fantasy" - there were great lessons in each section. Everything from "Where Ideas Come From" (Gaiman) to "WorldBuilding" with Elizabeth Bear to a couple of INVALUABLE roundtable discussions from luminaries in I normally read books on writing when with multiple contributors as I would an anthology. In general, there are chapters / lessons which are great and others which are either not applicable to my writing or otherwise of less value. Everything from "Where Ideas Come From" (Gaiman) to "WorldBuilding" with Elizabeth Bear to a couple of INVALUABLE roundtable discussions from luminaries in the editing world about why some short stories and novels work, while others do not. A somewhat helpful book for authors seeking insight into how publishers of SFF fiction view the marketplace and decide which works to purchase and publish. An excellent combination of general writing advice and specific looks at science fiction and fantasy! I know I will be reading over this again with a highlight to take notes because there were several incredibly helpful sections with bits of advice I want to remember. This is a great collection of advice by people from all over the industry. I was really happy to see discussions of licensed works (like Star Wars) included as well. A great addition to any writer's reference library! First of all let me say that Science Fiction and Fantasy are at the top of some of my very favorite genres to read! So from there I can say that this book was very interesting to read. Getting to hear about how some of the authors get their ideas about writing, their characters and how they write in general was awesome! This is a collection of advice from professional storytellers. It has articles and interviews from many people working in the books world. For non writers it gives you look into the work of writing and publishing. For writers it has tips and techniques to help writers on their journey. While I think this is an asset for any writer to own that does not mean non writers can not enjoy this. This is a great collection from some wonderful and fascinating writers of our time. A collection of essays by current and past writers. I didn't really find anything mind bending here, just authors talking about subjects like "beginnings", "middles" and "endings". Not a must have, but interesting reading. Editing is a good thing. Great content, but advice about writing and grammar should be free of grammatical errors. I took stars away for irony. This is a great book for those who are looking for input from well known fantasy/scifi authors, all current in the field today. I will keep this for inspiration and guidance.